Has GOD finally been discovered? Supposedly NASA Scientists believe GOD is 17,000 Light Years Away but is this all true? NASA Scientists were faced with a terrifying image that aimed at a galaxy that was 17,000 light years away. This started the speculation that the supposed Creator of Universe was finally caught on film. The Space Agency's Nuclear Spectroscopic Telescope Array or The NuSTAR was directed towards a pulsar called PSR B1509-58, and it's at an extremely staggering distance from earth. What was sent back was a masquerade of an outstretched hand which has become known as the iconic Hand of God. THE HAND OF GOD. Scientists believe the hand to be the remnants of a star which went supernova and ejected an enormous cloud of material which left pulsar PSR B1509-58 in its wake. When the remnant cloud was viewed via high energy X-rays, it showed up as a green, red and blue hand, which is about 175 light years across. NuSTAR telescope principal investigator Fiona Harrison said, "NuSTAR's unique viewpoint, in seeing the highest energy X-rays, is showing us well-studied objects and regions in a whole new light'. Fiona added that "The new image depicts a pulsar wind nebula, produced by the dense remnant of a star that exploded in a supernova." What was left behind from all this was a pulsar by the name of PSR B1509-58 which can spin around seven times per second and blow a wind of particles into material that was ejected during the star's death throes. When these particles interact with nearby magnetic fields, they produce an X-ray glow in the shape of a hand. Scientists currently are not sure whether the ejected material assumes the shape of a hand, or whether its interaction with the pulsar's particles was just making it appear that way. 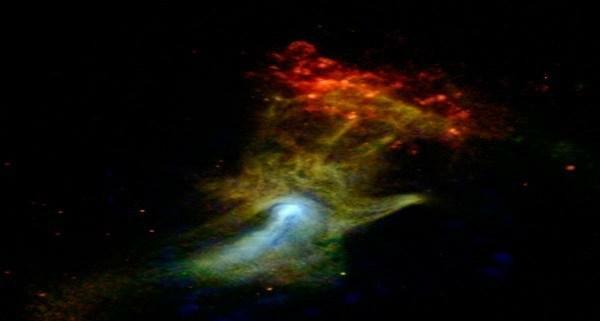 Scientists have gathered a few things from all this being that the NuSTAR hand looks more like a fist which has given them some clues and the red cloud that appeared at the fingertips is its structure called RCW 89. However, some believers that reside on religious websites are not interested in their views.